The global challenges facing the water treatment industry are far from conquered; billions lack access to basic drinking water or facilities to create it. But as scientists look for solutions, titanium dioxide (TiO2) is frequently on their radar. TiO2 has a range of photocatalytic capabilities that could improve the facilities used to treat our drinking water, making them more durable and efficient. 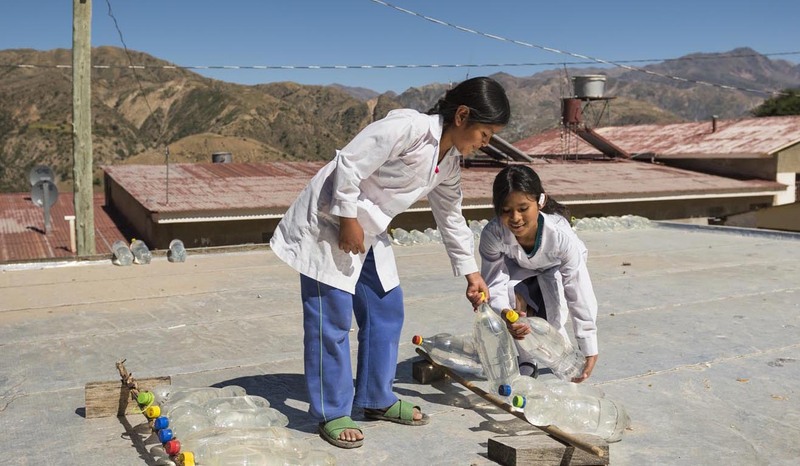 It also has a key long-term role to play in the future, both in combatting man-made pollution of water ways and helping third-world communities to gain life-saving access to safe drinking water. TiO2 can indirectly aid the water industry by improving the facilities used by water treatment specialists. With more efficient materials to work with, industry practitioners can focus on the tasks that really matter. One example is in outdoor piping made from Polyvinyl Chloride (PVC). It is estimated that PVC pipes last for up to 100 years – as long as they are maintained in the right way. 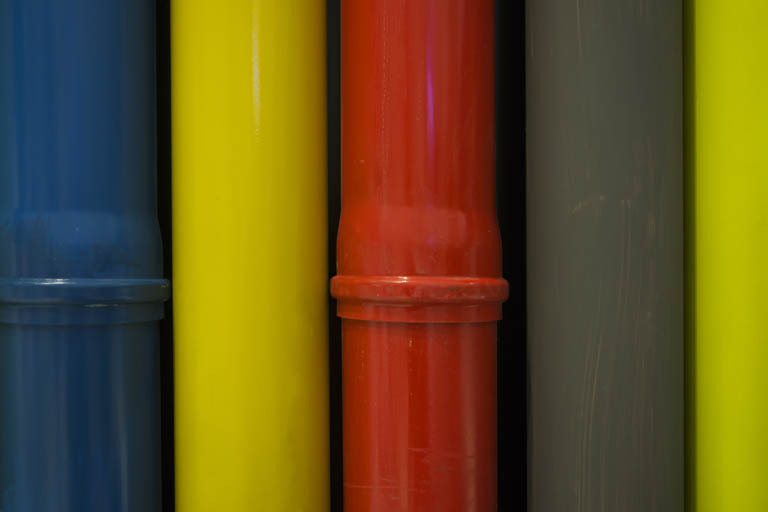 While PVC pipes may often be installed underground, they are also regularly used in situations where they are exposed to high levels of ultra-violet (UV) light – particularly in industrial applications, such as water treatment plants. When unprotected PVC is exposed to sunlight, UV radiation causes a series of complex reactions, which break down the polymer. Decorative wall with multi coloured PVC water pipes. Australian standards for PVC pipes have specified a concentration of TiO2 since the 1980s because of this vital role it plays. In a water treatment plant, the benefits of TiO2 can be widespread. TiO2 is often used to ease the cleaning of glass and concrete. As a photocatalyst, specific grades of TiO2 can interact with sunlight to break down organic matter both on and around the surface of, for example, concrete walls and glass windows. It could reduce maintenance and cleaning costs at water treatment plants. Titanium dioxide’s benefits to the water industry can extend far beyond facilities. Scientists are increasingly backing its qualities to find solutions in the treatment of the water itself. “TiO2 has been in the R&D arena for decades, both in the remediation and removal of organic molecules, but also in terms of energy production,” says Kieran Nolan, Head of School of Chemical Sciences at Dublin City University (DCU) and an expert in the study of titanium dioxide for use in water treatment. It’s one of the recognised solutions in the oxidation process, to ‘polish’ the water or, in other words, to clean molecules out of the water that were missed in the primary and secondary stages of treatment. TiO2 continues to be featured in ground-breaking studies, for example its proposed use in graphene sheets as an alternative to activated carbon in the polishing stage of water treatment. Another area of interest to Dr. Nolan’s team at DCU is how to combat the presence of pharmaceuticals in both water and the wider environment. In recent years, concerns about the presence of pharmaceutical ingredients, solvents, and raw materials in bodies of water, including wastewater of the pharmaceutical industry itself, have gained increasing attention. Multiple studies across the United States, Canada and Europe have found traces of pharmaceuticals in drinking water. A number of research projects are looking into treatment methods to aid both the detection and wearing down of these pharmaceuticals. Researchers have proposed various methods to remove pharmaceuticals from wastewater, including using photocatalytic TiO2 to break them down. It is affordable, non-toxic, and safe. Graphene is one atom thick lattice of carbon atoms, isolated in 2004. Either TiO2 is added to the surface of the graphene sheets or is used with activated carbon, in both cases functioning to degrade or remove a wide range of molecules that remain in water, even after the first two stages of purification treatment. “This is pretty state-of-the-art research right now,” says Dr. Nolan. “We have found that it does work – but it’s very expensive.” Although very much still in the R&D stages, this is another example of scientists finding answers to difficult questions in this field using TiO2. Titanium Dioxide has been described by the Royal Society of Chemistry (RSC) as ‘the future of water treatment’. Among its potential capabilities, it could safely and cost-effectively improve already-established practices, such as solar disinfection (SODIS). SODIS is a pretty simple idea that has existed for several decades and is beginning to change lives in communities across the developing world. Water is placed into transparent containers, which are then exposed to the sun. The water then becomes safer to drink because the energy of the solar radiation destroys microorganisms. One solution is to coat the inside of clear containers, such as glass or plastic bottles, with a layer of very fine TiO2 particles, which would enhance the action of light. This simple solution, with the aid of TiO2, could give more people access to clean drinking water and save lives. To read more about the role of TiO2 in using sunlight to clean drinking water, visit this page. It’s clear that TiO2 has a key role to play in the water treatment industry, both directly and indirectly. As scientists continue to utilise its qualities to improve performance in the sector, the possibilities are endless.